The genetics of Tetra Spindazzle injected in Florida daylilies came from Dan Trimmer’s CROCODILE SMILE. Dan Hansen, Luddy Lambertson, Gunda Abajian and John Peat all have introductions out of Crocodile Smile. Dan Hansen used Crocodile Smile in his several introductions including DEVINE LIGHT. This daylily helped Dan produce one of my favorites of his, VORACIOUS VIXEN. V.V. while short in our garden is healthy and hardy. Sandy was very happy to use V.V. in her hybridzing program. Luddy used Crocodile Smile in several of his introductions also. His FLORIDA SCRUB JAY , a second generation C.S. cross from BIRD TALK, was taken by Gunda and used to produce LEDGEWOODS JUNGLE MUSIC and LEDGEWOOD’S WHEN SPIRITS UNITE. Gunda also produced a first generation Crocodile Smile cross with her introduction of NINA VERHAERT. John Peat used Crocodile Smile to produce CRAIG GREEN, which John carried on into his BARNACLE BILL and HELMUT WEICHSELBAUM. HELMUT W. and NINA V. are closely related in that they both have FORTUNES DEAREST in them. © 2010, Mike. All rights reserved. Copyright extended to images. 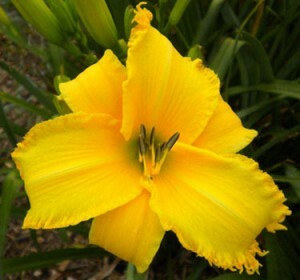 This entry was posted in Daylily Hybridizing, Introductions and tagged Dan Hansen, Dan Trimmer, Fortunes Dearest, Gunda, John Benz, John Peat, Luddy, SPINDAZZLE. Bookmark the permalink.